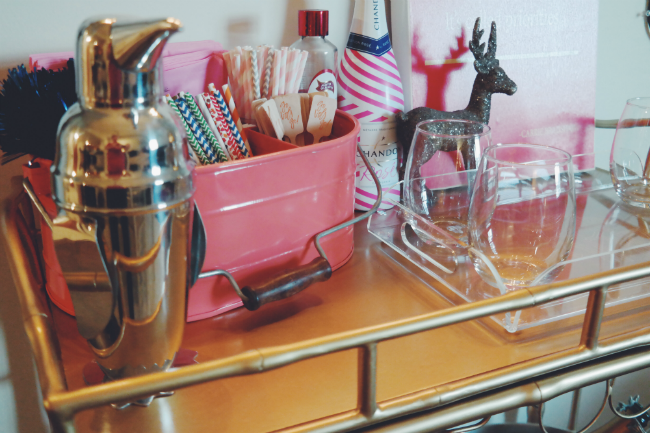 We're a few weeks away from Valentine's Day, and just about the only thing in the spirit (no pun intended) is my Society Social Bar Cart. I've never been a huge fan of this holiday, nor do I typically decorate for it. 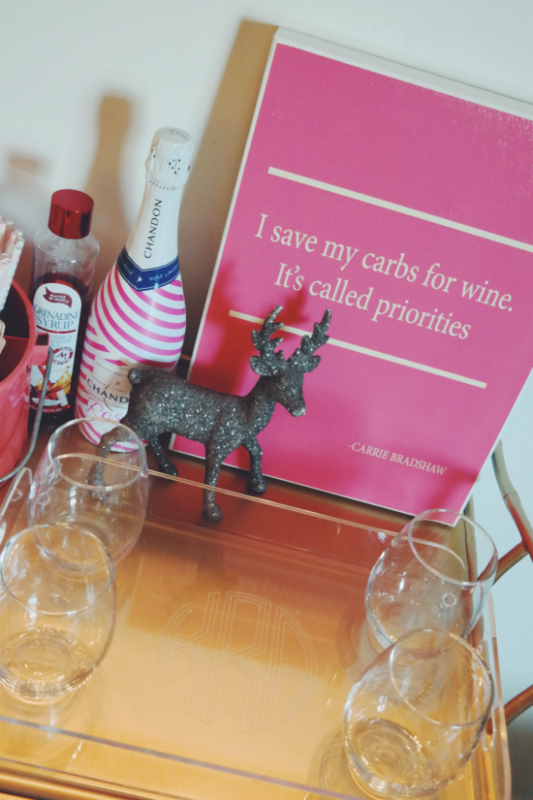 But since y'all loved my last bar cart post, I thought I'd spruce up the cart and get it ready just in time for February 14th. While I'll be enjoying the actual day with three wonderful friends, riding back on the Amtrak from New York Fashion Week, my romantic plans are yet to be determined (i.e. 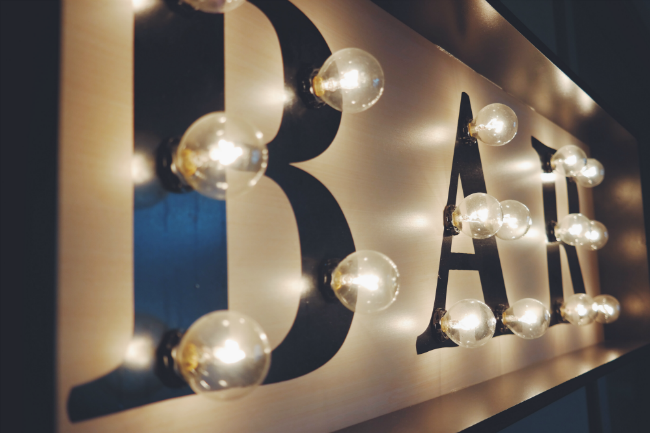 they don't exist yet… but there's still time. Am I right ladies??). 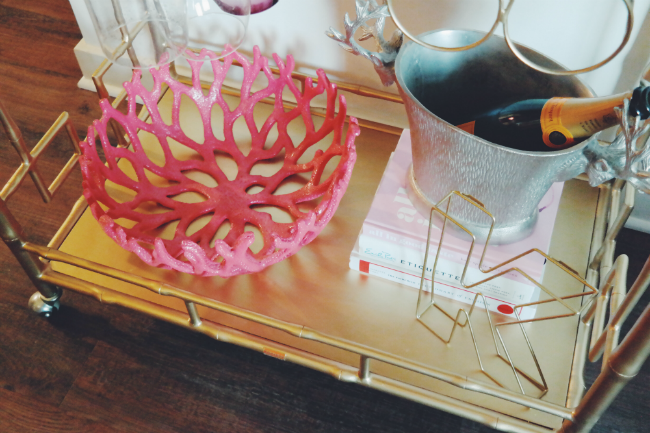 I didn't want to spend a crazy amount of money on adding Valentines-esk decor to my cart, so I decided to work with pieces I already owned. 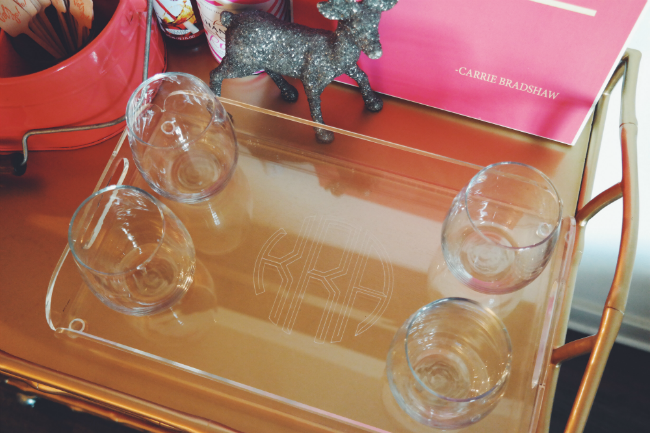 I brought back the Carrie Bradshaw quote sign, a pink tin to hold all the essentials, a brand new monogrammed tray and wine glasses, my coral bowl and a monogram K. You too can capture the same look, simply by adding a few "color of love" pieces to your cart. Once the "day of love" passes, I'll be really sprucing up (this time, pun definitely intended) the cart just in time for spring. Can't wait to share another post with y'all soon! 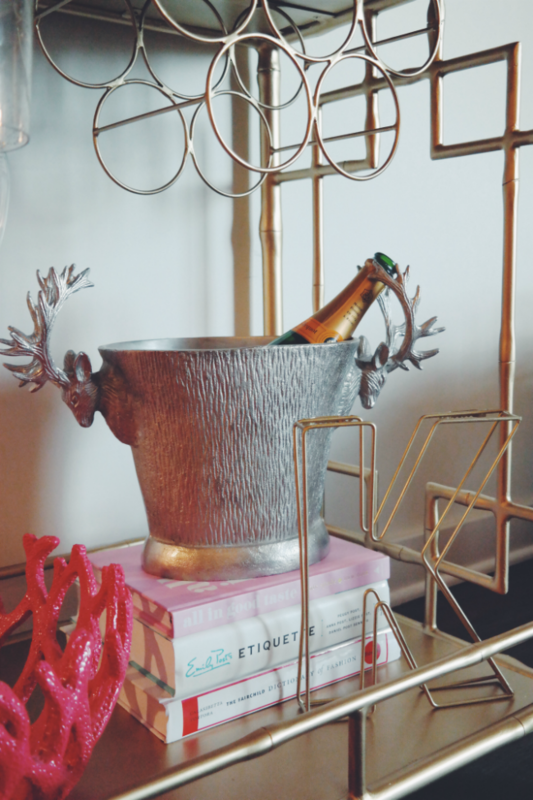 In the meantime you can shop some of my bar cart essentials above or via the widget below. Just click the link or photo to shop each piece directly. Thanks Brittany!! That's how I felt this past week, so this weekend I decided to clean off the cart and update. Can't wait to see yours!! 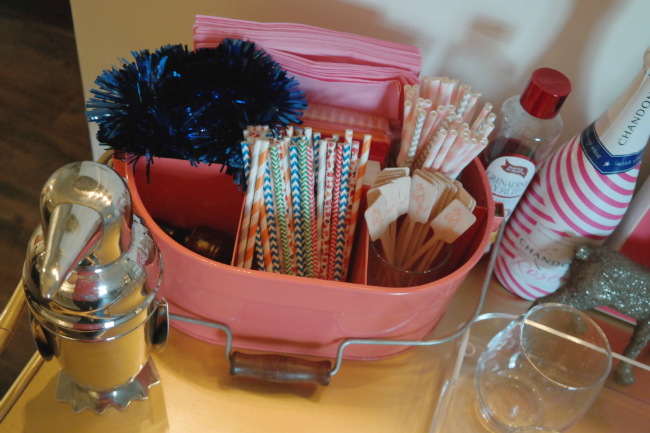 Thanks so much Krisinda :) so glad you enjoyed it! Thanks for reading!! 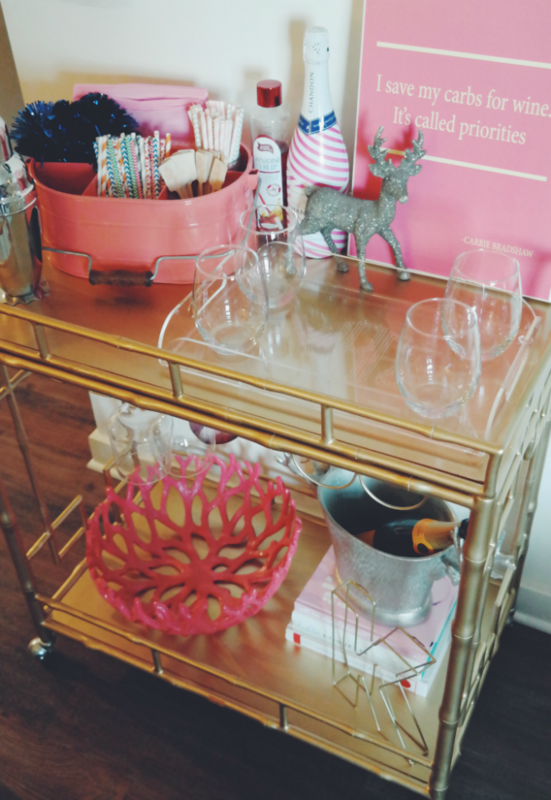 Your bar cart is too cute! Where did you find it? Thank you!! It's from Society Social :) the link is featured above and takes you to the exact car featured in the photos. It's such an amazing investment piece!! 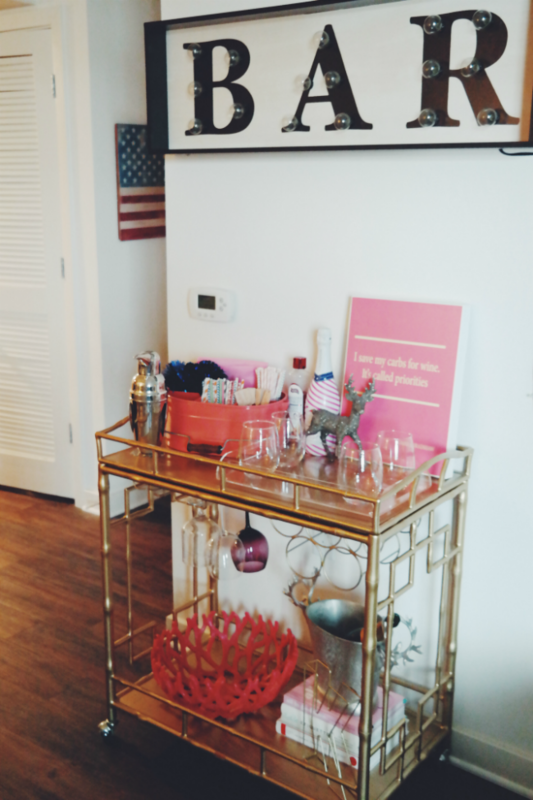 Your bar cart styling is awesome! 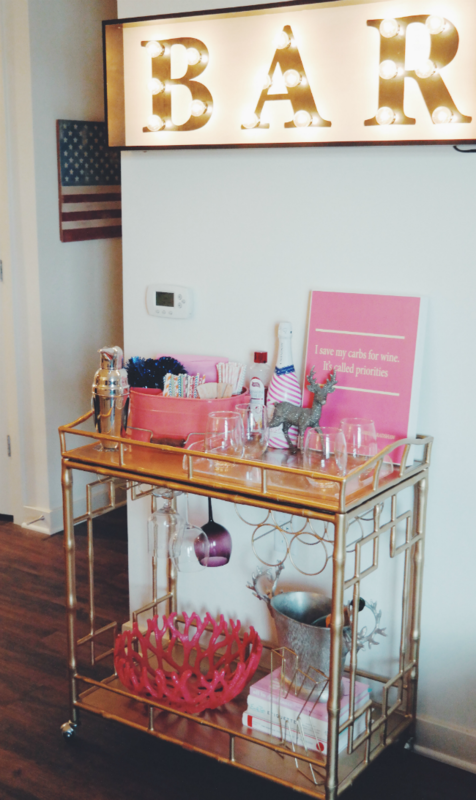 I don't typically decorate for Valentine's Day either, but I love the idea of switching it up in that space!